I first read about this process years ago. I wish I could remember where, but I did read that somebody had found out through experiment, that amps, not volts, was the secret. He got the best results with a 5 volt 8 amp power supply. I have to caution anyone attempting to use electrolysis on antique padlocks. You are dealing with chemistry here. You have to be extremely careful on what electrolyte is being used to remove ferric oxide. Yes, you may be removing rust, but you may also be damaging the springs--possibly making them weak and brittle. 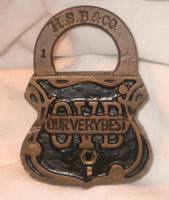 I would never buy an antique padlock that has been put through the process. you were doing (which I don't) lol, Even then, it seems there are probably better options. Gordon: wasn't sure if you were joking at first, lol. But you're really looking for a way to free up that safe. least. Also interesting would be your wife's face when she sees you hoist a safe into the air. haha!! Anyway, I know how you operate and I have no doubt you'll gather all the info you need before starting. set it up outside or in a very well ventilated area. Especially an electro-monster of that size. I am currently working on an Eagle pin tumbler padlock with what appears to be a frozen plug. The pins move but the plug does not, even with a screwdriver or other object to turn it. Would electrolysis be a viable way to try and get this thing moving? Was responding to you in jest with dunking the entire safe, or even 'just' the door. But do want to be aware of all options when I start working on getting the safe boltwork freed up. Seriously doubt I would resort to such extreme measures, but it can't hurt to look at all possible rust removal options for freeing up the boltwork. Will most likely be using a large brass punch and brass hammer to free up the botlwork with some rust penetrant. jeffmoss26 wrote: I am currently working on an Eagle pin tumbler padlock with what appears to be a frozen plug. The pins move but the plug does not, even with a screwdriver or other object to turn it. As Mark has mentioned, it works through 'line of sight'. So I really dunno if it would help. It's hard to say. Baths/soaking with various chemicals along with some 'persuasive' taps might be a more promising option. Jeff, why don't you ask your friend (pick'n n grin'n)? He's a master at destroying padlocks through electrolysis. He certainly likes to use your name a lot. How do you really feel? I was not aware that electrolysis would ruin any locks until I saw the posts above. I am just happy with locks that have working keys, and Rick is able to do that for me. Jeff, the electrolyte being used during the redox reaction and the voltage is what causes removal of the ferric oxide. The process can also target materials such as springs that are not intended to be cleaned. Springs can loose their spring capability or even become brittle or break. You have to know what the alloys of the springs are made of so that they to do not become reduced. I can rant all day long about what Rick does. I don't agree with his ideas of restoration. Polishing a lock to no end is not restoration. That's called taking all historical evidence off the table. I don't read anyone commenting on his videos other than you. And, his videos appear to be nothing more than advertising tools for his Ebay sales. If nothing else, why doesn't he show people his pancake lock jig, rather than demonstrating it deliberately out of frame of the camera (highly suspicious). I have no problem showing people mine, or maybe it is mine that he is using (LOL). I learn nothing and the audience learns nothing (except one video picking a railroad lock). He discusses using impression, but fails to show or teach anyone in the process. 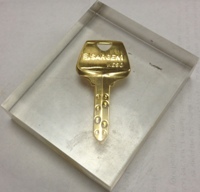 There's some locks described that any antique, specialty locksmith would know--- you don't use impression, you use single bit, double sided test keys. Eight Lever "SAMSON" is one example. I know--I know, it doesn't matter how he got there. Jeff, if you are willing to buy into what he does, more power to you. I see no skills and a lot of impression bragging. That sounds like a good candidate for an ultrasonic cleaner. UCs will remove all surface-adhering contaminants like rust, dirt and grime - their cleaning capacity functions across all surfaces of the submerged object, including blind cavities. Also, I've heard of people having good luck with soaking rusted-shut locks in their cleaning/degreasing solution of choice for up to a week. Good luck with your lock and be sure to post pics if you get it working again. I've been playing with this recently! Cool way to get rid of a lot of old crap of off stuff. I got the best results with Calcium Carbonate (not Bicarbonate), 24V, 14 amps. Unless you have some carbon rods (which I am afraid I do not) then be prepared to get a bunch of metal sacrificed from your anodes though...which is fine if you can find some scrap steel. I find having the anodes clean and ground down to bare metal to work best too. Calcium Carbonate? That's chalk isn't it? Is that really what you meant? Classic electrolyte was caustic soda (lye) which is Sodium Hydroxide. Washing soda, which is Sodium Carbonate works well too. Lol, yes, sodium, not calcium. Not chalk. And don't use calcium carbide, either. One spark and you are welding!